The intimate details of the structure of minerals can be observed under the high magnification of an optical microscope. 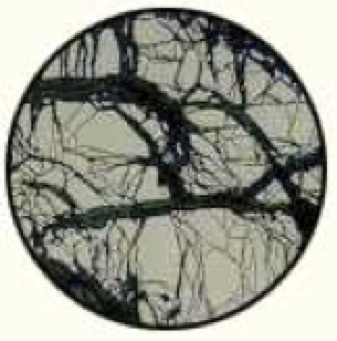 Below are photomicrographs taken through the optical microscope during process studies. The Leitz Orthoplan microscope allows us to observe minute details such as intergrowth characteristics or inclusions as fine as 0.5 micron. Dark veinlets of chalcocite (Cu2S) transecting a pyrite particle. Froth flotation of this ore yielded unacceptably low copper concentrate grades due to insufficient pyrite-chalcocite liberation and attendant pyrite carryover into the concentrate. Based on the results of microscopic studies of this ore, the mill operators learned to properly blend ore types and optimize the grind to improve profitability. A complex intergrowth of titanium and iron oxides. 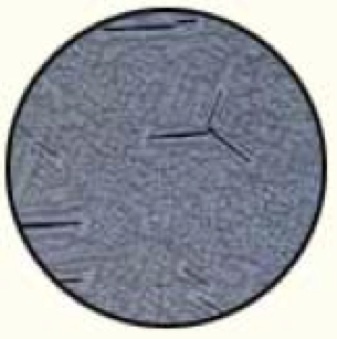 The brownish-gray continuous phase is the titanium mineral (ulvöspinel), and the light crystallites are magnetite with several black laths of gangue. No amount of grinding would make a physical separation possible, so the potential investors decided not to acquire the deposit as a titanium resource. Optical microscopy detected the cause of a very stable solvent-extraction emulsion. 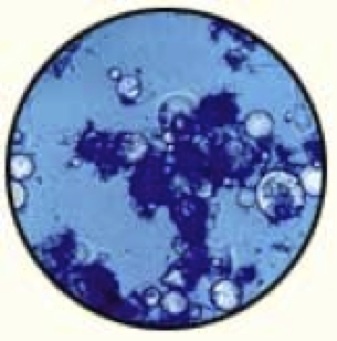 Adding blue stain to the aqueous phase revealed that tiny bubbles of organic phase were trapped in coagulated clay particles. These studies led to methods to improve solvent recovery. 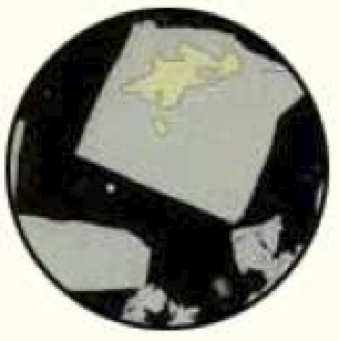 A pyrite particle (cream) that contains encapsulated gold (yellow), demonstrating why extraction by cyanidation was poor. Very fine grinding was needed to improve recovery.